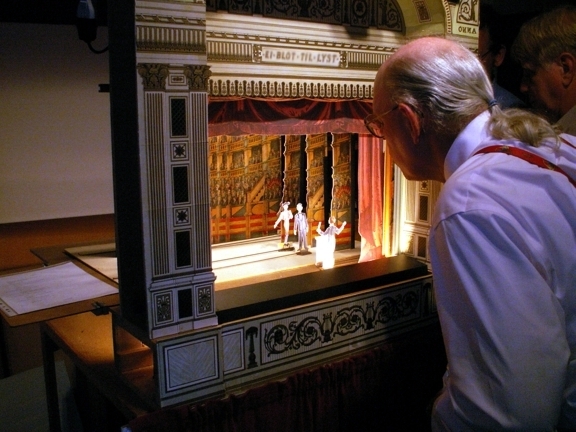 Model Theater is also known as Toy Theater or Paper Theater, in Danish as Dukketeater, and in German as Kindertheater. All artwork and content of this site are © Copyright 2003-2010 Kannik's Korner and its licensors. Welcome to our model theater shop! Model Theater is also known as Toy Theater or Paper Theater, and in Danish as Dukketeater, and in German as Kindertheater. See below for more information. Above: Fritz Kannik examines an enlarged Royal theater following a performance of Carmen at the Danish Model Theater club. Model theater, or toy theater, dates to the early 1800s, and was in its highest form during the late 1800s and early 1900s. Printed sheets of theater fronts, called prosceniums, are used to build the face of the wooden theater. Other printed sheets of figures and scenery are pasted to cardboard and cut out to use in the theater. Figures are moved with special sticks, curtains rise and lower, some figures can be made with moving parts or reversible, and special effects enhance the action! Only your imagination is the limit! We have two basic sizes, Large and Small. These are based on the two most popular sizes still commonly used in Danish model theater, which was highly developed by the lithographer Alfred Jacobsen. Our Large size is the Alfred Jacobsen C size, and our Small size is his D size. We also have some reprints of German and English sheets, which are similar to the Small size. For more information on sizes, please visit our Theater Sizes page. Reprints and some original sheets are available, and we are very proud to be able to offer these through our secure online shopping cart. They are suitable for other uses, such as dioramas, shadow boxes, framed for hanging, cutout for wall borders or accents, scrap-booking and other creative books, to name a few. Use the Red links above to browse the sheets, and the green buttons to the left for more information. Please bookmark our site and visit again to see what is new. We will be adding sheets periodically. If you would like notice of new items, please join our email list. Be sure to visit my bibliography of Books related to Model Theater. For more information on other toy theaters, see my Model Theater Links page.